One of the best shows I've witnessed in recent years was last month's HMV Forum hop by The Jayhawks, a concert you felt was being performed for friends rather than punters. The new songs were greeted with the same enthusiasm as the older classics, such as "Settled Down Like Rain", "Blue" and "Waiting for the Sun". A worthy 4-stars, methinks (it would have been 5, but for the 'polite' sound-levels). This month sees the band release their much-anticipated new album, "Mockingbird Time", and I can exclusively reveal it's a fine return-to-form, which is a glib thing to say seeing as they've never really lost 'form', as such. But it's been over eight years since the last full-length set, "Rainy Day Music", making it a bit of an event. You'll be hooked on "Show Your Colors" and "Closer to Your Side", soon enough, I promise. 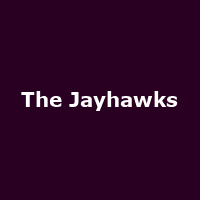 Next year, The Jayhawks will return to the UK to reach the parts their previous visit didn't touch before, with the exception of the capital. First stop will be London, this time being the wise choice of the Barbican on 8th March, followed by Edinburgh (10th), Liverpool (11th) and Bristol (12th). More shows may be added at a later date - I guess it depends on how many eager-beavers buy the album! We will have tickets on Friday, priced at £17.50 - £20 and demand is expected to be pretty high. Trust me, they're well worth seeing - you don't get that many country-rock sweet-harmonies and enchanting jangles to the English pound, that often!